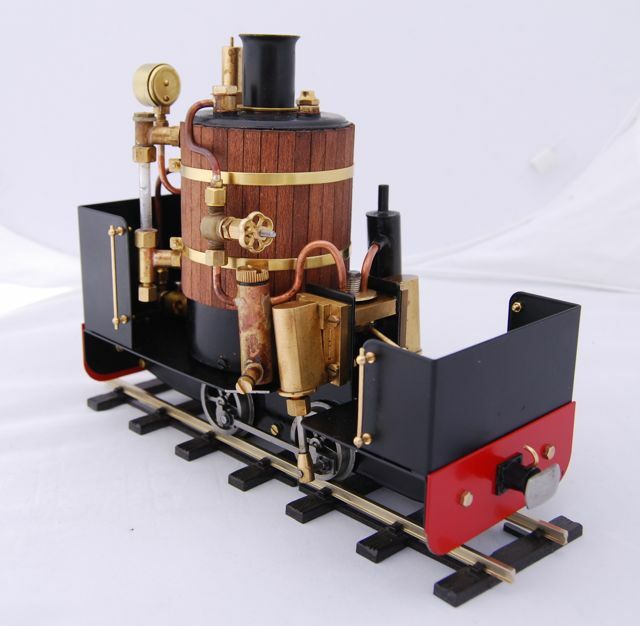 This vertical boilered locomotive is loosely based on the locomotives made towards the end of the 19th Century by De Wintons of Carnarvon and looks particularly fine on a train of slate wagons or tippers. 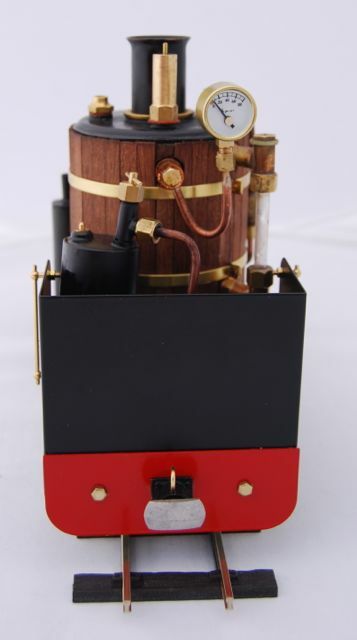 It features the same high quality components as on Janet but this time with a ceramic burner fired boiler. The boiler is quite sophisticated having an open central flue with three cross tubes. 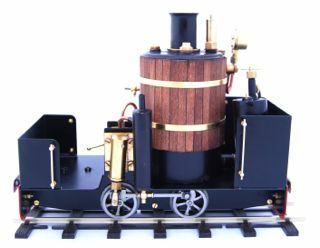 It is fitted with a water gauge glass, safety valve pre-set at 40psi, a water top-up valve, a 3/4" pressure gauge and a spare steam take-off for later use. The steam is delivered to the well-engineered cylinders via a globe-type regulator, a lubricator with drain valve and our standard reversing block. The exhaust steam passes through a condenser to remove as much water as possible. This cab view shows the top of the gas tank (the large one is fitted as standard), the standard 3/4" pressure gauge and water sight glass. The safety valve is in the centre of the boiler and the water top-up valve to the left. The unusual and distinctive look of De Winton is sure to excite comment and admiration. It is a powerful loco despite being quite compact and is fully capable of hauling a prototypical load. As with Janet, it is available with optional multi-height couplings to enable easy height matching with a variety of stock. De Winton is available only in powder-coated black. The wood cladding with brass boiler bands as depicted is an optional extra. 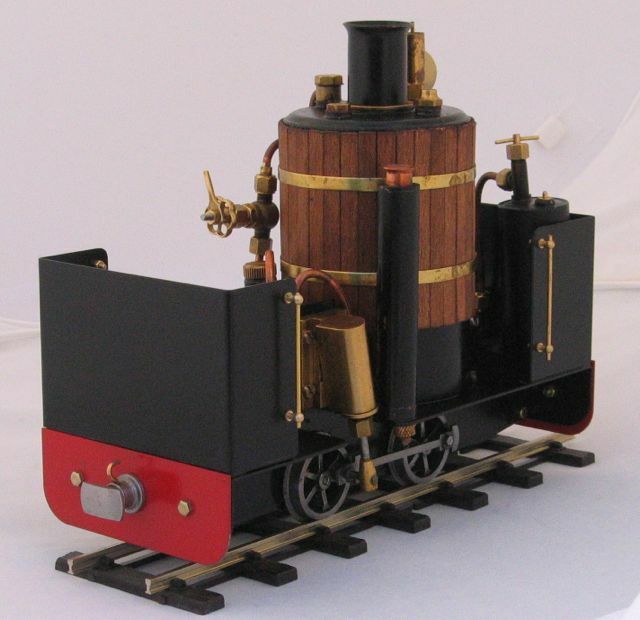 The standard boiler arrangement is plain black as alongside. 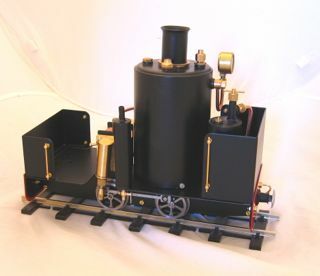 The loco has the larger gas tank fitted as standard. I often get asked about the duration time. I've recently tested De Winton on a chilly but sunny day. It took 8 minutes to raise steam and, pulling the heavy concrete-filled tippers in the Janet video, the run lasted a good 20 minutes. The water was topped up once during the run with about 40ml. This is shown in the two photos to the right. The end nearest the camera is normally the lower end and this conversion makes both 'cabs' the same height - great for 16mm but particularly suitable for 7/8 scale. It is pre-sprayed satin black and is securely held in place by the lower handrail knob. Retro fitting requires a hole drilling through the existing cab to make the handrails the same height. Correct length handrail wire is also supplied. 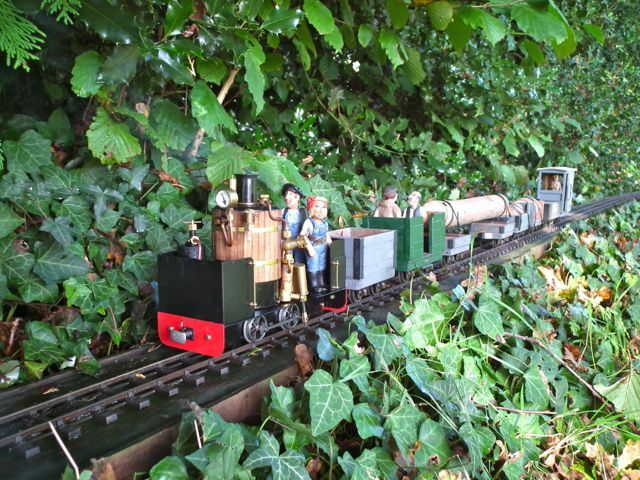 The lower photo was taken on a sunny day in January 2013 by Chris Bird on his Summerlands Light railway. Although still very suitable for standard 16mm scale, this photo shows the loco with two of Rob Bennett's 7/8 scale Busybodies figures. The wagons are tubs made by Chris from Swift Sixteen kits and fitted with larger than standard Binnie curly spoked wheels. Filled with gravel, they make a substantial and demanding load. this is fitted using a completely new purpose designed condenser/resonator, exhaust and drain as can be seen on the video. Chris Bird has developed the FX control which allows the user to select between full, softer and almost no chuff at will. 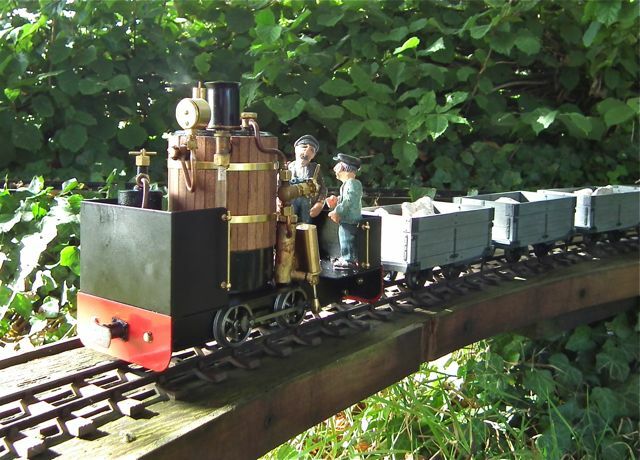 This one shows De Winton as a 7/8 scale loco. The two figures are from Rob Bennett's 7/8 Busy Bodies range. 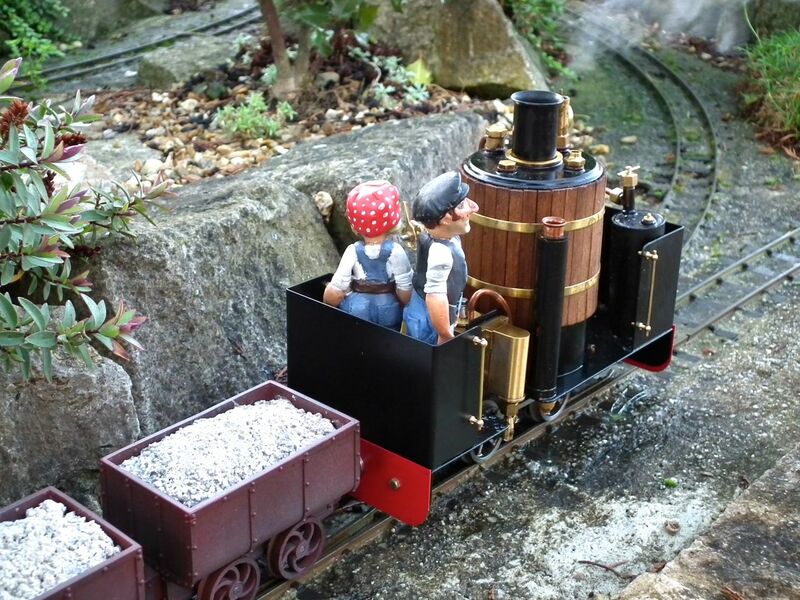 The wagons are scratch built by Chris Bird. The loco 'cab' has been raised by an additional sheet not easy to spot here but a comparison with the handrail in each photo will make it more obvious. The loco seems equally happy in either guise as can be seen in Chris' excellent video opposite. The video also demonstrates the effectiveness of the Summerlands Chuffer installation. It's more expensive than just the standard Chuffer because it is a complex installation requiring a substantially rebuilt condenser but I hope you agree that the effort is worth it.